This technique is covered elsewhere in this book, but is included for the sake of completeness. In patients with advanced bladder cancer or other pelvic malignancy, a palliative urinary diversion such as a cutaneous ureterostomy may be considered as an alternative to percutaneous nephrostomy tube drainage, or where such drainage may be poorly tolerated long term. Patients may be candidates to undergo general anesthesia but comorbidities preclude extensive or prolonged surgery. In other instances, palliative diversion may be advised prior to planned pelvic radiation. Two studies have reported this procedure laparoscopically. In 1995, Loisides et al. performed a laparoscopic transperitoneal cutaneous ureterostomy on a 59-year-old patient with a solitary functioning kidney. Repeated percutaneous nephrostomy access had exhausted this option, and after successful urinary diversion, dialysis was avoided at 18 months follow-up. In another report, Puppo et al. described their experience with videoendoscopic cutaneous ureterostomy in nine patients, six of which were performed bilaterally. 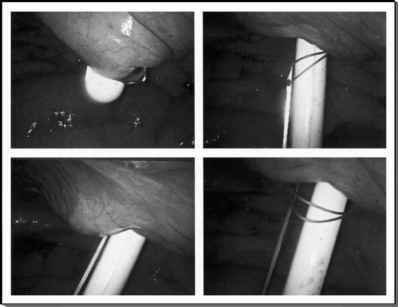 The procedure was performed transperitoneally in five patients, and via a retroperitoneal approach in the remaining four.